Astrophotographer Miguel Claro captured this image of the Andromeda Galaxy from Portugal on July 27. Autumn is the best season of the year for astronomical observing. The bugs of summer are gone, winter's cold has not set in and it gets dark at a reasonable hour. The favorite targets for most amateur astronomers are what are called "deep-sky objects." They are large structures beyond the stars in the immediate galactic neighborhood. These cosmic sights include clusters of stars within the Milky Way and even other galaxies, distant islands of stars. Because of their distance, these objects are faint and hard to see. You may need to travel to a darker location to spot them. In late October, there are no bright stars in the night sky. That's because, at this time of year, skywatchers are looking northward out of the disk of the Milky Way, so there are relatively few stars to interfere with the view. Even though many of the brightest stars observers can see from Earth don't make an appearance in the sky this month, that doesn't mean that skywatchers can't use some dimmer stars to spy interesting objects. Off to the left of Pegasus is the "W" shape of Cassiopeia. Below it is Perseus, one of the richest areas in the Milky Way. Pegasus, Cassiopeia and Perseus form the skeleton of stars, through which skywatchers will look for more distant targets. First and foremost is Andromeda — the largest galaxy in the cosmic group that includes the Milky Way. Andromeda is about 2.54 million light-years from the Milky Way. That means that the light people see from its trillion stars has been traveling toward Earth for more than 2 million years. Use the autumn constellation patterns to locate the Andromeda Galaxy and other deep-sky objects. Beginning stargazers often get confused over objects named after the constellation in which they are found. 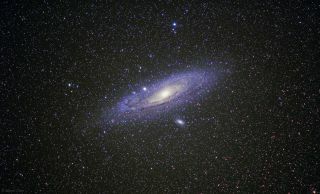 Thus, "Andromeda" can refer to both the Andromeda Galaxy and the constellation Andromeda, where it is found. Similarly, "Milky Way" can refer to both the home galaxy of the sun and the band of its distant stars, which are seen in the night sky. You can most easily locate the Andromeda Galaxy by using the constellation Cassiopeia as a guide. If you think of the right-hand part of the "W" as an arrowhead, it points directly toward Andromeda. A more precise way to locate it is to start with the Great Square of Pegasus. Its left-most star, Alpheratz, marks the head of Andromeda, the queen of Ethiopia in Greek mythology. What should you look for? Andromeda is so far away that its trillion stars combine to make a very faint glowing patch. You can see this most easily with binoculars. Once you spot it, however, if you have a dark sky, you should be able to see it with your unaided eye. People seeing Andromeda for the first time will swear it is the faintest thing they have ever seen, though to experienced astronomers it seems blindingly bright. A useful trick for teasing it out of the background is to use what astronomers call "averted vision." This takes advantage of a feature of the human eye where your most sensitive vision is just slightly off center of your field of vision. Look slightly off to one side of Andromeda’s location, and it should pop into view. It is actually easier to see Andromeda in binoculars than in a telescope because it is so large. It is larger than the field of view of most telescopes, so it’s easy for you to sweep right over it without noticing it. Use the lowest magnification and widest field of view available on your telescope. Now for some easier targets. These are clusters of stars within the galaxy that includes the Earth. The brightest is known as the Pleiades, or the Seven Sisters. In the early evening it is low down on the horizon; by 3 a.m. it is almost overhead. You can easily see this with your unaided eye, even in the city. Without any optical aid, you can spot about six stars in this cluster, but binoculars will reveal dozens more. In Japanese this cluster is known as Subaru, and the automobile named for it uses its stars as the car's logo. The Pleiades are located 410 light-years from the sun. Between Cassiopeia and Perseus are a pair of star clusters known as the Perseus Double Cluster. The clusters consist of hundreds of stars that are densely packed together, and are a treat when viewed in binoculars or a small telescope. They are located 7,000 and 8,000 light-years away. The final object is much more challenging: the Triangulum or Pinwheel Galaxy. You can find it using the same two stars you were asked to use to find the Andromeda Galaxy, but going in the opposite direction, south instead of north. It is 2.87 million light-years away, slightly farther than Andromeda. Though easy enough to find, Triangulum is very difficult to see. Although large in size, larger than the full moon, and quite bright, it has a very low surface brightness because of its size and orientation. It can be seen in "plan view," so that its outer reaches fade away into nothingness without any sharp edge to catch the eye. To see Triangulum, you will need a dark sky and either binoculars or a telescope with a wide field of view. Despite the difficulty, some sharp-eyed observers have actually spotted it without any optical aid. In fact, it is used as a marker of an extremely dark sky and extremely sensitive vision. Editor's Note: If you have an amazing image of a deep-sky object or any other skywatching photo you'd like to share for a possible story or image gallery, please contact managing editor Tariq Malik at spacephotos@space.com.